The end of WWII had left the United States and the Soviet Union as the two global superpowers, and Korea, a Japanese protectorate, was far down their respective lists of priorities. Pre-occupied with imposing control on Eastern Europe, the Soviet Union simply wanted to ensure that Americans troops were not stationed near its borders, so the 38th Parallel was selected as the dividing line between the Russian and American occupation forces. Unwilling to navigate the mix of political factions, the active support of the American occupation forces ensured that American-educated Syngman Rhee was elected president of the Republic of Korea (ROK). Kim Sung-il, who had served with the Red Army during WWII, became the Soviets’ candidate in North Korea. Both Rhee and Kim wanted to reunify Korea by force and believed that the other side would fall easily, but their respective backers had different approaches. Aware that Rhee would provoke a war if permitted, the United States had refused to provide the ROK army with planes, tanks and artillery. However, Stalin approved Kim’s invasion plan, supplying the North Koreans with generous quantities of planes, tanks and artillery. When the North Korean People’s Army (NKPA) crossed the border on June 25, 1950, its large, well-trained army steamrolled through the unprepared ROK forces, starting the Korean War. Believing that remaining neutral would be interpreted as weakness by the Soviets, President Harry Truman won the support of the United Nations for the defense of South Korea, assigning the military response to General Douglas MacArthur, commander of the American occupation forces in Japan. Nearly bankrupted by the massive expense of WWII, the American army had been allowed to decline, while reinforcements were sent piecemeal, so the NKPA had gained control of all of Korea except for a small perimeter around the port of Pusan by August. The NKPA had already burned itself out with repeated frontal attacks when an amphibious landing at Inchon caught the North Koreans completely by surprise. Seoul was recaptured on September 25, and the NKPA began to disintegrate. Cut off from its battalion, a platoon of American soldiers is alone in the countryside, surrounded by the enemy. Following a devastating attack by enemy tanks at the Naktong River, their regiment had retreated, leaving the soldiers to fend for themselves. Fortunately, they come across Sergeant Montana (Aldo Ray) driving a jeep with a shell-shocked colonel. Protecting the colonel as if he were a child, the sergeant’s sole goal is to take to him to Pusan, so that he can be shipped to a hospital in Japan. Determined to bring the remaining 17 men of his platoon back into the war, Lieutenant Benson (Robert Ryan) wins a showdown with the sergeant and takes the jeep, which is needed to carry supplies. Although disgusted that Montana has withdrawn from the war, Benson desperately needs the hard-bitten veteran’s help, so the colonel is allowed to ride in the jeep in exchange for Montana agreeing to stiffen the inexperienced troops. Benson’s last orders were to make his way to a specific hill in order to link up with the rest of the army. As the soldiers march through the countryside, they are stalked by Koreans, who move silently through the woods. The men are killed one by one by unseen enemies: snipers, shells, and mines. The survivors finally reach the hill, but there is still fighting to be done. The American forces sent from the 8th Army, the occupation force in Japan, to prop up the ROK army had suffered a number of embarrassing defeats since the arrival of the first units on July 1. US troops would retreat with an almost insane desperation because the NKPA liked to outflank a unit, surround it, and then kill everyone rather than waste troops guarding prisoners. NKPA troops often launched suicidal human-wave attacks, which strengthened the US soldiers’ belief that the enemy was not human. By the end of July, Lieutenant General Walton Walker, commander of the 8th Army, had 45,000 ROK troops and 47,000 US troops but disease and shell-shock, heightened by lack of food and rest, were sending thousands of soldiers to the hospital. On August 2, Walker decided to pull back across the Naktong River to establish a perimeter, roughly 70 miles long and sixty miles wide, around the key port of Pusan. The NKPA launched a major assault on August 31, and broke through in several areas. By September 5, Walker was reluctantly considering retreat, but it soon became clear that the enemy offensive had exhausted itself. The defenders at Pusan had survived largely because Walker had spent most of his time near the front, pushing scared or worn-out units to hold the line. The story takes place on September 6, 1950 during the worst period of fighting at Pusan, but the script reverses the actual situation. Instead of US troops trying to get past entrenched NKPA positions, the NKPA was trying to force its way through the perimeter and capture Pusan. Some of the men are scared but only a single member of the platoon displays signs of shell shock. However, the movie shows correctly that most of the soldiers had grown soft during the comfortable occupation in Japan. Benson’s resentment that savages like Montana are needed to win the war is misplaced, since the men who survived the war were not inhuman savages, just tough and disciplined. Most important, the methods employed by the NKPA that gradually whittle down the platoon are largely guerrilla tactics. The NKPA had infiltrated guerrilla units into South Korea in order to disrupt transport and communications at the start of the invasion, but the fighting at Pusan was performed by the regular NKPA, and the strategy was to simply throw men at the enemy until the enemy broke or the NKPA ran out of men. 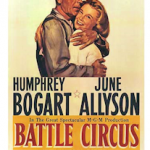 The forty-seven-year-old Robert Ryan is completely out of place as a junior lieutenant, who would have been in his early twenties, but it is a memorable performance and Ryan plays one of his toughest characters. Suspecting that screenwriter Phillip Yordan was a front for blacklisted writer Ben Maddow and angered by the portrayal of the soldiers as undisciplined, the Pentagon refused to supply tanks or soldiers as extras. 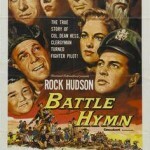 The Pentagon’s lack of cooperation drove director Anthony Mann to work with composer Elmer Bernstein to create a claustrophobic film, where the isolated platoon battles the landscape, while coping with attacks from an invisible enemy. Deprived of resources and limited by a small budget, the combat scenes are weak. 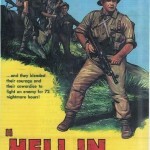 It is true that the movie was not a flattering portrayal of the American military in the Korean War, but it is not an anti-war film like movies that came out in the 1960s. However, like Pork Chop Hill, made two years later, it stripped away part of the myth that American soldiers were always brave and ready to fight. Having started his career in film noir, Anthony Mann had graduated to westerns, crafting action-packed westerns with noirish elements and a heavy dose of tragedy. 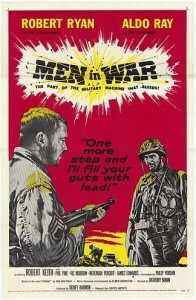 Men in War was his first traditional war movie, and he was clearly ill at ease with the genre. Despite his discomfort with the subject, Mann skillfully builds tension. It is a good movie but it is not really about Korea, just disillusioned veterans and scared recruits. This disconnect from the Korean War reflects the fact that script is based on a novel about the Normandy landing during WWII. Furthermore, the story of a small unit making its way to safety while battling an unseen enemy has more in common with the plot of The Lost Patrol (1934) or the many westerns about a cavalry patrol making its way through Indian territory than the Korean War. The two leads are both weighed down with responsibilities. Benson’s face becomes increasingly grim as he adds each new dog tag to the little of pile of dog tags he is carrying. The scenes of Montana encouraging the colonel to talk are quite moving. Although he does not have a single line in the movie, Robert Keith is outstanding as the colonel, visibly struggling to make words come out of his mouth, but unable to deal with what he has seen. It is a strange movie, good and harsh, but strange.